Without question the Quran is a living, breathing scripture of eschatological evolution and supreme guidance! "I just completed surah 75:14-15 (Al-Qiyamah)and have to admit that submission to the supreme Holy Quran is the only option for me. 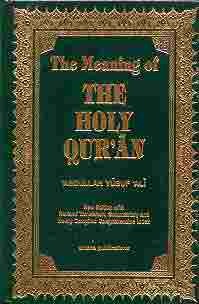 Without question the Holy Quran is a living, breathing book of eschatological evolution and supreme guidance! The Holy Quran, more than any scripture or even all combined, also confers divinity and authority upon Shri Mataji to emancipate humanity on a breath and scale that i am only now beginning to fathom. The fact that the Divine Feminine spoke Arabic while conversing with Prophet Muhammad will be of tremendous significance and solace for Muslims. The flawlessness and universality of Allah's Plan for humanity will destroy any lingering doubt in the heart of the believer of any religious background, provided he or she reads the entire http://adishakti.org/al-qiyamah.htm site. Islam, especially its mystical beating heart, is not what the ulema (Islamic clergy) have made it to be. Far from it!" Namaste - i bow to the Ruh (Holy Spirit/Shakti) who resides in you! 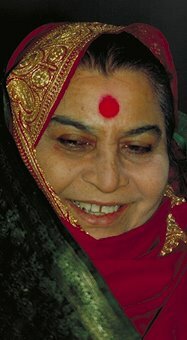 The Holy Quran has come alive during this blessed Night of Destiny as the incarnation of the Ruh of Allah, Shri Mataji Nirmala Devi collected, promulgated, recited and explained the manifested Signs and surahs upholding the commencement of Al-Qiyamah! Her Advent and Message is for the benefit and emancipation of all human beings. More than 14 centuries ago the Quran's stern tone of warnings and dire consequences was necessary to subdue into submission the vulgar, violent and warring desert inhabitants. The very nature of these illiterate, stone-worshipping and fetus-killing tribes required repeated warnings to fear God as the Resurrection will take place. They had to be told in the easiest of terms that one day in the far future when the Hour nears, they will take birth again as human beings to face it -"Does man think that We cannot assemble his bones? Nay, We are able to put together in perfect order, the very tip of his fingers.”The Holy Quran had to be revealed in the most simplistic of words and parables possible to make it comprehensible to the overwhelmingly uneducated, doubting masses of Jahiliyyah, the dark Age of Ignorance. Today the nature of most Muslims—benevolent, liberal, modest, forbearing, patient, enduring, frugal, sincere, straight-forward, decent, lovers of peace and truth, and, above all, trusting in one God and submitting to His will—is a far cry from their distant ancestors and inhabitants of Jahiliyyah. The Ummah is now able to understand the collection, promulgation, recital and explanation of surahs upholding Allah's Command to witness the Resurrection promised to them 14 centuries ago .... and able to make an informed judgment of the consequences of rejecting the Warners! On the day of requital the Judgment shall be passed, not on the recommendation of any"son of God"sitting on the right hand of God (THE JUDGE), but on the evidence—truthful and outspoken evidence—of our own hands and eyes and feet and other organs... The Judgment will no doubt be coloured with inexhaustible Mercy. We have been assured that no mother loves her children more than the Creator loves His creatures. So we can safely expect that the Judgment will be permeated with the spirit of love. But we must never and never and never delude ourselves with the idea that the Judgment will lack justice or be based upon favoritism or canvassing; that any man or woman will receive unjust commendation; or that any person, even Christ or Muhammad, will be exempted from full accountability.